Choose your Diamond Accent shape based on personal preference, your center stone shape and the type of setting desired. For Color, consider accent diamonds that are 1-3 Color grades lower than the main stone, as long as they still appear colorless. This Round Brilliant Cut engagement ring includes Diamond Accents that are of complementary Color to the center stone. 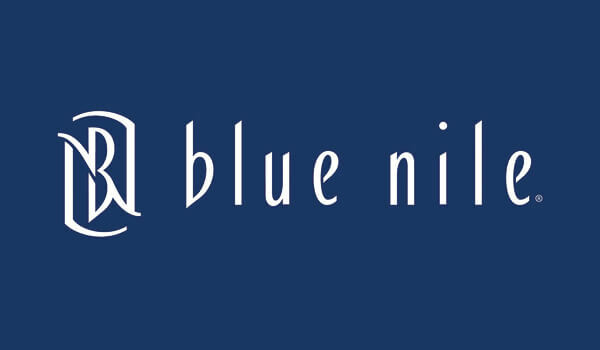 For Clarity, we recommend any grade where the diamond is eye clean, and there is no reason to go any higher—or pay any more—than that. When it comes to matching accents with your main stone, ensure the Color, size and style are complementary, like in this Round Cut Diamond in a pave setting. For assistance with designing a ring and choosing the perfect side stones, contact our diamond experts. Diamond Accents refer to the small diamonds that are placed beside a larger stone in a jewelry piece. They are designed to enhance the overall beauty and brilliance of the piece of jewelry. They add style, elegance and personality to a wide range of Diamond Shapes and ring settings. The Diamond Accents in this Round Cut Diamond are prime examples of side stones bringing extra volume and sparkle to a ring. The side stones in this 18K white gold ring show how Diamond Accents complement various Diamond Shapes like the Princess Cut. Accents are generally chosen based on personal preference, though the shape, size, color and quality impact the overall beauty of the ring. In most cases, Diamond Accents are found in Baguette, Trillion Cut or small Round Diamond shapes. These designs best complement different types of centerpiece diamonds while maintaining a reasonable price point. The Baguette is an ideal accent stone because of its large table size and appealing symmetry. Classic in appearance, Baguettes are often available in smaller Carat weights and can be arranged next to other Baguettes to create a row of diamonds. Its step cuts provide a contrast to other Diamond Shapes generally used as a center stone, like a Round Cut or Cushion Cut. Baguettes tend to have less brilliance (i.e. sparkle) than Small Round Diamond Accents and Trillion Cut Accents. A Tapered Baguette has a modified rectangular shape because one end of the diamond is wider than the other like in this 14K white gold Tapered Baguette and Princess engagement ring. Often used to follow the curve of a jewelry setting, Tapered Baguettes provide a classic look while adapting to the particular style and shape of the ring. For example, this Emerald engagement ring shows how a Tapered Baguette acts as an elegant and timeless Diamond Accent while also being unique. Tapered Baguettes are popular especially in Side Stone and Three Stone settings. They complement almost all Diamond Shapes, including Round Brilliant Cuts, Emerald Cuts, Radiant Cuts and Princess Cuts. Straight Baguettes are almost perfectly rectangular, unlike the Tapered Baguettes, and are equal in width across the stone’s length. They provide symmetry to a ring and often appear larger than other diamonds of an equal Carat weight due to their substantial table size. As accents, Straight Baguettes can be arranged alongside a larger center stone or placed adjacent to each other in a row, providing the appearance of a full diamond band like in this channel set Baguette Diamond ring. The Straight Baguette can complement a range of Diamond Shapes, though it’s most commonly used to accent Round Brilliant, Marquise and Asscher Cuts. Distinct and full of personality, Trillion Cut Diamonds embody a triangular shape. 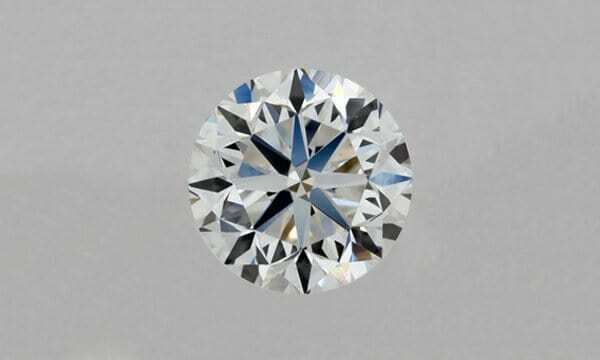 The unique shape is a divergence from the more common round, square and rectangular accent diamonds. Trillions are complementary as side stones because they bring attention to the main stone without overpowering the piece. They also easily follow the natural curve of a ring, like in this stunning 18K white gold three stone pave diamond ring. Due to their immense table width, Trillion Cuts tend to look larger than other stones of the same Carat weight. Trillion Cut Diamonds work best as accents in a Three Stone setting with Round Brilliants like in this beautiful 14K white gold diamond ring, or Cushion Cuts like in this exquisite 18K white gold ring. Trillions also pair well with other Diamond Shapes like the Princess and Radiant Cut. Small Round Diamonds are simple and stunning accents. Their classic round design makes them an excellent match for every Diamond Shape and are well placed in Three Stone, Side Stone, Pave or Channel settings. Each Small Round Diamond has the full number of facets for a Brilliant Cut: either 57 or 58. In the past, Single Cut Small Round Diamonds were cut with only eight main facets, but these are no longer used in the jewelry world. Small Round Diamonds provide extra sparkle, personality and elegance to rings, necklaces and bracelets. Using Small Round Diamonds as accents, a ring can be designed to match the unique style and taste of the wearer. In Channel setting rings, Small Round Diamonds create a row of vibrant sparkle while highlighting the main stone (if there is one). Channel settings tend to be thicker—and Small Rounds do an exceptional job lighting the jewelry piece, like in this Round Cut 14K gold channel setting. For Pave settings, Small Round Diamonds stand out and add extra brilliance as there is less setting material than in Channel Settings. Depending on the style and size of your Small Rounds, your ring may appear like it is a band filled with diamonds, like this Radiant Cut 14K white gold ring. In addition to choosing the shape and style of your Diamond Accents, you’ll want to match them aesthetically to your main stone. When matching accent diamonds, Color must be considered. Differences in one Color grade (i.e. G to H) are often hard to notice with the naked eye. For example, an H Color will generally appear the same as a G Color, even though the price may differ significantly. The eyes are also naturally drawn to the center diamond due to its larger surface area and greater reflection of light. For this reason, we generally recommend choosing accent diamonds that are 1-3 Color grades lower than the main diamond—while still ensuring the accent diamonds appear colorless. When it comes to Color, your center stone should appear the most colorless. 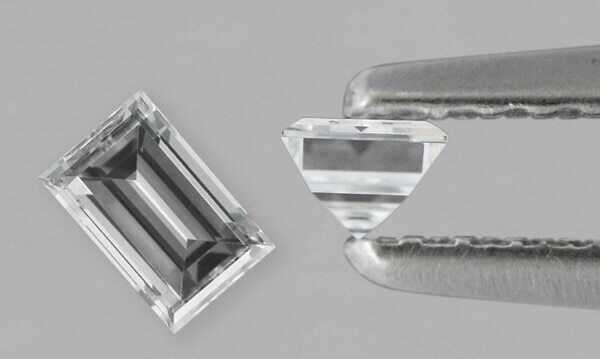 In the two example images below, Diamond A’s main diamond presents a yellow colored tint when contrasted with the better Color graded side stones. 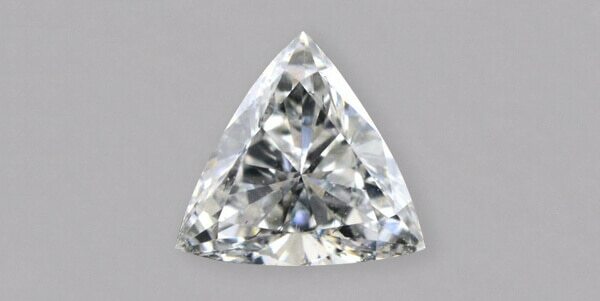 In Diamond B, the main stone appears colorless because the side stones have an equivalent or slightly less colorless appearance. Depending on your center stone, you may be able to choose accents designated 1-2 Clarity grades lower than your main stone, though we recommend choosing Diamond Accents that are eye clean. There is no reason to choose a higher grade and pay more for something that will go unnoticed. If your accent diamonds are small—such as 0.02 Carats or less—Clarity holds little importance. In this case, you may be able to go 2-4 Clarity grades lower than the main stone. If you are designing your own ring, consider ordering Melee diamonds to match your specific design and center diamond. Use a site like Abe Mor to choose your details of Carat, Color and Clarity. Diamond Accents generally range from 0.01-0.18 in Carat weight, chosen primarily on personal preference and how the accents look in the setting. Three stone and side stone settings, for example, generally look balanced with accent diamonds that are approximately half the size of the main stone. When designing a three stone ring, be sure the diameters of the side stones approximately equal the table size of the center stone. 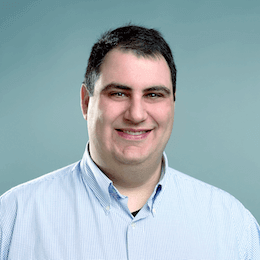 The table size can be calculated by multiplying the dimensions of the center stone by its table percentage (which is listed on the lab certificate). This Princess Cut Diamond ring is a prime example of sizeable accent diamonds in a three stone setting. To determine the ratio or size comparison between the main stone and accent stones, utilize the outside diameter measurements of the stones or compare Carat weights. For assistance in calculating the ratio or choosing stones that are complementary in size, contact one of our diamond experts. For Pave settings, smaller accents are generally more aesthetically pleasing due to the greater number of side stones that are used, like in this exquisite platinum pave setting diamond ring. A solid rule for Pave settings is to choose Diamond Accents that are ⅙ or less the size of the center stone. Similarly, a channel set will look sharper with smaller accent diamonds (⅙ or less the size of the center stone), like in this Round Cut Diamond 14K white gold ring. Only certain tension setting designs have accents. These settings hold the diamond in place by pressure exerted from the open ends of the ring, rather than using typical prongs. Diamond Accents are generally small with tension settings in order not to take away from the intricate design of the setting. This Round Cut Diamond with four accent stones in a 18K yellow gold tension setting show how smaller accents can call attention to the center when using the right design. In terms of overall design, the size of Diamond Accents often comes down to personal preference and offering the right balance to the ring. Certain designs lend well to smaller side stones, like a channel or pave settings. 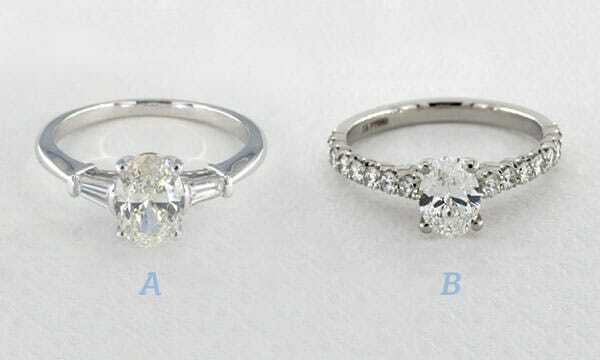 Other designs, like a three stone or side stone setting, appear more balanced when larger side stones are used. If you decide on two larger side stones, though, be sure they are almost identical in size and proportions. Consider, too, the size of the wearer’s hand and how large the center stone will be. Your Diamond Accents shouldn’t be too small or too large in comparison. Our diamond experts can assist in choosing beautiful accent stones to balance both your ring and center diamond.